Brighton & Hove City Council and BT have joined forces to make free wi-fi available at a range of locations across the city centre. The new ‘BrightonHovefreewifi’ outdoor network covers the busiest areas for tourism, shopping and leisure, providing free wi-fi for local residents, hundreds of businesses and the 11.5 million people who visit the city each year. A total of 40 BT Wi-fi hotspots are available, allowing visitors and residents to get online while ‘on the go’ through their smart phones, tablets and laptops. The service covers a large proportion of the city centre, including parts of Western Road, Queens Road, West Street, North Laine, London Road, St James’s Street and the seafront between Brighton Pier and the Hilton Metropole Hotel, as well as in front of Hove Town Hall on Church Road and at the top of George Street in Hove. People within range of the network will be able to tap into free wi-fi following a simple on-off log in. 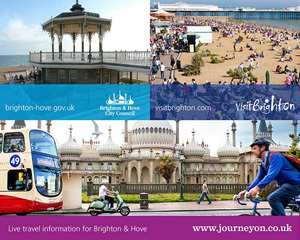 They will then be taken automatically to a landing page with links to the council homepage, VisitBrighton the city’s main resource for visitor information, and the city's JourneyOn travel planning pages. Click on the ‘Get online’ button. The session will automatically close following a period of inactivity of 15 minutes. If you'd like more information, visit www.btwifi.co.uk/help. The network comes at no cost to the council. In return, BT will get access to some of the city’s lamp posts and other street furniture allowing the company to install new mobile infrastructure. The council has chosen BT to build and manage the network for ten years. Access to the Brighton & Hove wi-fi service is free and unlimited to all. BT Wi-fi is a wireless broadband (wi-fi) service that you can access in public places (hotspots) such as airports, hotels, coffee shops, motorway service stations and many other city centres. It’s a great way to connect your laptop, tablet or mobile device to the internet when you’re away from home or your office, without needing a phone line. What speeds are people likely to experience when using this free wi-fi? Speed will always be dependent on a number of factors, like proximity to the access point and the number of other users using the service, but we have designed the network to deliver the right performance for the number and range of users and devices we expect to see. The BT Wi-fi helpdesk is open 24 hours a day, every day. It is UK based and the team has extensive experience in helping customers to use BT’s public wi-fi services. No. Wi-fi is perfect for uploading or downloading large files at high speed as speeds are likely to be faster than 3g and 4g. How secure is BT wireless broadband? use a virtual private network (VPN). There are multiple providers for the various operating systems such as Windows, iOS or Android. always use “https” sites, if you’re passing any user credentials or private information. upgrade to the latest version of the operating software (OS) relevant to your computer, laptop or device. always make sure your firewall, virus guard and browser are all up to date. Do wireless local area networks (WLANs) present a threat to health? Health and safety is at the heart of BT and its operations – we are very conscious of our responsibility to the public, employees, customers and other stakeholders – and take it very seriously. We monitor industry reports and intelligence about the potential health risks posed by wi-fi and note that there is no credible evidence that the extremely low exposure levels from WLANs pose a threat to human health. The World Health Organisation has issued a fact sheet regarding base stations and wireless networks, and its conclusions were: "Considering the very low exposure levels and research results collected to date, there is no convincing scientific evidence that the weak RF *radio frequency) signals from base stations and wireless networks cause adverse health effects."